A thousand trees were planted in a matter of hours by volunteers Saturday morning as part of an effort to restore the trees lost in the April tornado outbreak. 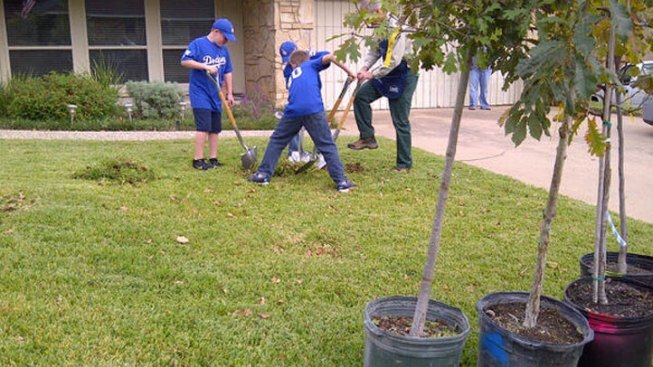 Seven months after tornadoes tore through southwest Arlington, residents got some help returning their neighborhood to normal thanks to the Arlington Tornado Re-LEAF event Saturday. One twister uprooted thousands of trees but on Saturday morning dozens of volunteers planted about a thousand new trees in storm-ravaged neighborhoods. Rachel Ciupek-Reed's home on Chapel Springs Court still needs a new roof, but she says the new trees lift her spirits. "I wouldn't know where to put the trees, and how to get them all put [in] correctly," she said. "It means a lot to have trees again, because they're beautiful and it makes it feel like home." Each homeowner got up to four free 10-gallon trees of different varieties. The new trees were provided by a $40,000 donation by the Arlington Tomorrow Foundation. Corporate and private donations made the plantings possible. More about Re-LEAF Arlington at KeepArlingtonBeautiful.com.